You can install the “Simple CGM” watchface, which can request data from your Share account, use the link below on your smartphone to open the App page in the Pebble Store. 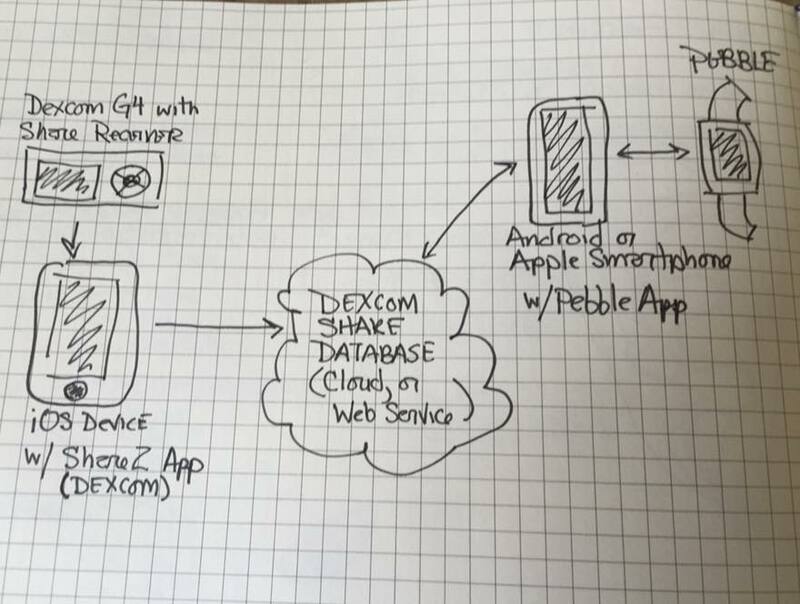 The watchface requires active use of the Share receiver with the Dexcom Share2 iOS application sending data to their cloud service. 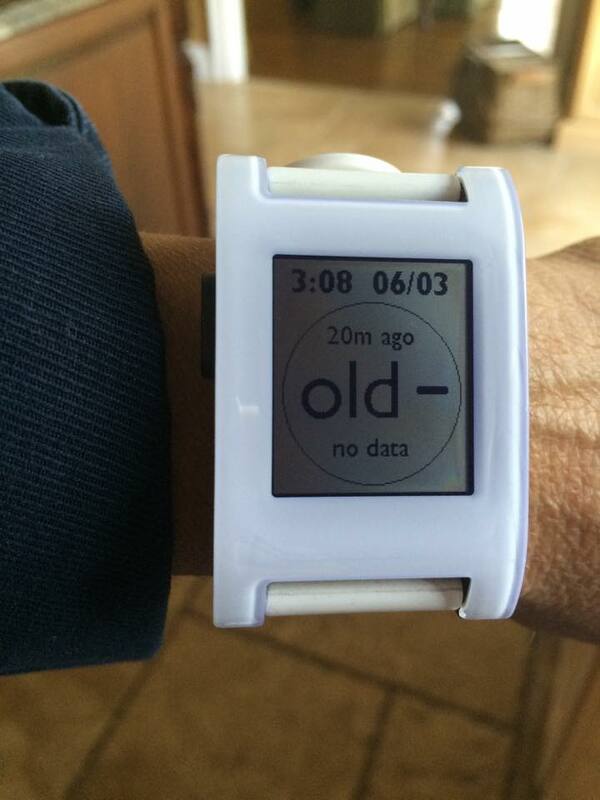 After installation, you must open the settings for the watchface from within the Pebble smartphone app. SELECT “Share” as the mode. The other two options are not supported/functioning. NOTE: mmol/l has not been thoroughly tested, as Share is still US only. 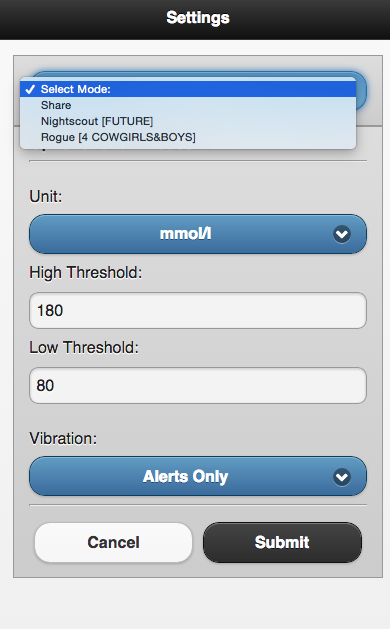 Set your Vibration type: “New & Alerts” will vibe for every new BG read (double vibe) and any new BG in the Alert ranges. 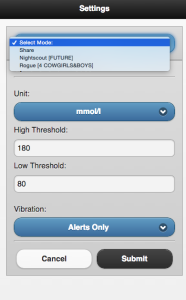 “Alerts Only” will long vibe for each BG in the Alert ranges. There is no snooze option yet, so it will vibrate every 5 minutes if within the ranges. The watchface will let you know if you have the account info wrong. For Time: out range High will show Yellow (circle) color, Low will be Red, in range is Green. For Original: out range High will show Black (circle) color as will Low, in range is a White circle (black text). Comm Errors are specific to communication between the watch and the phone app. These occur when the watch face or the smartphone Pebble app isn’t functioning properly, or the Bluetooth messaging between them is failing. If the internet connection is down or causing the issue, you should see “net error” in the circle (where the BG delta usually is) and the BG will be blanked out. Now, in a perfect world, these errors never overlap, but I have absolutely seen a flakey internet connection or other apps on the smartphone (or the OS itself!) cause Bluetooth issues (Comm Error) or trigger bugs in the smartphone app or watchface. I do my best to test in various conditions, but it’s nearly impossible to cover all. 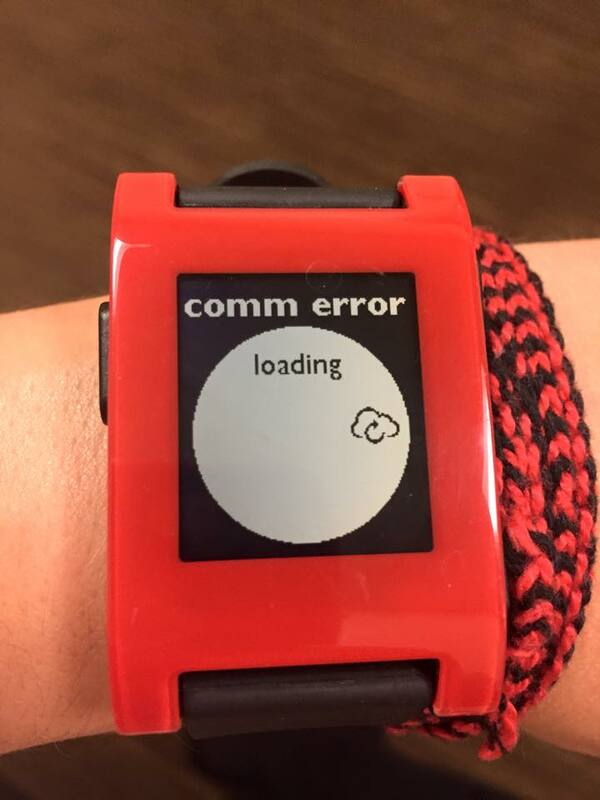 For comm errors: I open the pebble smartphone app, force quit and relaunch, cycle watchface. If it didn’t work: I turn Bluetooth off (on the phone), and back on again (airplane mode off and on does the trick too), force quit pebble app and relaunch. Cycle watchface. Still no luck? Power cycle both devices, relaunch pebble app after both are back and ready. Net errors: try your web browser, does it browse to websites? Try a website you never go to to verify you’re not hitting a cached site. On wifi? Turn it off and try on cellular only. 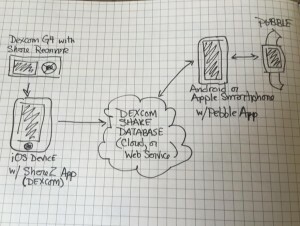 In this situation, does the pebble pull data from the dexcom reciever or from the iphone using share? Just installed! I discovered that installation is incredibly easy – I just opened the link to the app in Safari on my iPhone, opened the file as prompted in the Pebble app, adjusted the settings appropriately and loaded it to my Pebble. Super easy, super simple. John, thanks for all you do! Very very very non techy mom to a T1D 11 year old boy. My son has the Dex Com Pediatric Share. He also has an Iphone 5s. I have an Iphone 6+. 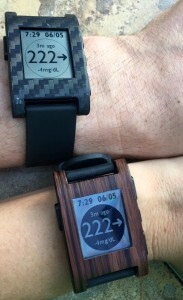 Can I get a Pebble watch and just download this watchface/app with no other devices needed? I tried to set up a Heroku account to set up the bridge and didn’t get beyond the first screen. I was thinking that I would just bite the bullet and get the apple watch but reviews aren’t thrilling me. I really just want to keep track of my son’s BG on my wrist and not much more. Yes, that’s the idea behind this watch face. It ties directly to the Share service. This is amazing! So simple to install. I cannot believe how easy it all came together. I am not a tech person and I had it up an running in 2 minutes. My daughter even wants a watch now.